Japanese label Accident Records have put out some fine records, however hard to come by they are. There's the reissue of the old La-Di-Da comp Hoopla, the Trixie's Big Red Motorbike compilation, and of course Don't Send Me Flowers - the collection of all (?) the Twa Toots material. Twa Toots were, like Trixie's Big Red Motorbike, an early 80's British pop band and it's not too much of a stretch to call them pre-tweepop. The two main women were Sarah Brown and Philippa Richmond. Sarah was also in Sundress with Mark Randall (Fat Tulips), who recorded the Give Your Heart Another Day EP for Sunday Records in 1994. Three years before that Twa Toots released a reunion single called "Don't Send Me Flowers" and this is it. 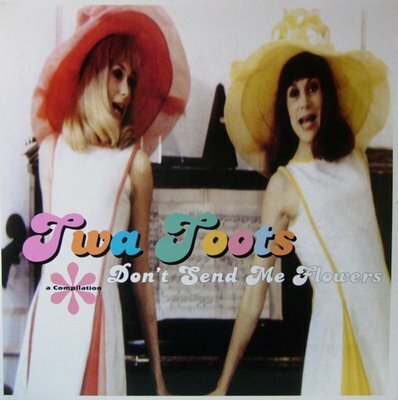 I just happen to have la-di-da and the twa toots comp, great stuff!